Carol making the front page of Clay Times Summer 2013. Also featured in this picture are Carols black and yellow labs Laska and Seryozha. Even the tiniest of work have been created with great passion. Carol shaping and altering one of her extruded pieces in her studio. Under the chair with Laska! 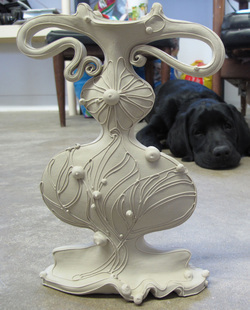 One of Carols envelope vases with slip trailing. 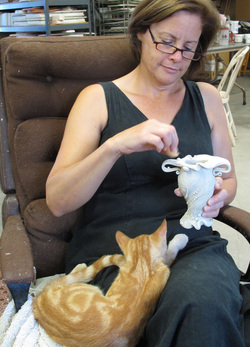 Carol working on an extruded piece in her studio in St. John Kansas.